I have a 4x8 H0 scale layout. I'm 13 years old and REALLY thinking about switching to DCC, I need to know really fast because I want to ask my parents to get it for Christmas. 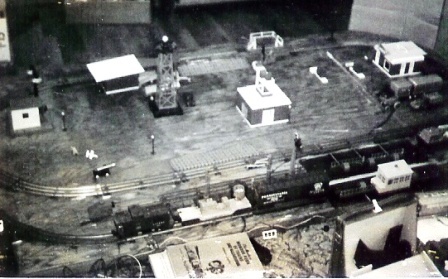 This little bit of ancient model railroad history dates back to the 1950's, and all of the elements are there. The milk platform and gate keepers house are classics of that time. Likewise, the transfer table in the foreground was brand new from Lionel that year. The only thing missing from the photograph are the growly Santa Fe F-Units and the big TW transformer that drove the whole thing. But enough about us. I would like to know which system to have between the Zephyr and Super Empire Builder. Which system do I ask for? For your purposes, the Zephyr Xtra should do fine. It is a good system and you can add different devices and modules as necessary. Although the Super Empire Builder Xtra is more powerful, the Zephyr is easier to learn with and can be easily expanded as your needs require. The advantage of Digitrax is the LocoNet, which is a network for your railroad. If you look at a comparison among the Digitrax starter sets, you will note that the Zephyr is rated at 3.0 Amps, which tells you how much power the unit supplies to the railroad. While the Super Empire Builder and Super Chief sets are more powerful, they are also more expensive. The Zephyr is a good choice in your situation, and you are not buying a dead-end system; if your power consumption needs grow in the future, you can easily add more power with additional boosters and power supplies. 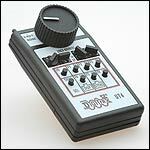 Likewise, the Zephyr has LocoNet, which is common to all Digitrax system components. LocoNet is Digitrax's network for your railroad, which connects all the parts of your railroad together in a single control system. Another consideration is that Zephyr Xtra (and the Super Chief sets) "read back" the configuration values you enter into the locomotive decoders, while the Super Empire Builder does not. Reading back CV's is very helpful if you are doing changes to your locomotive decoders, but you may not get to that point for a time. What if I had 2 people controlling the layout at a time with the Zephyr? 1. 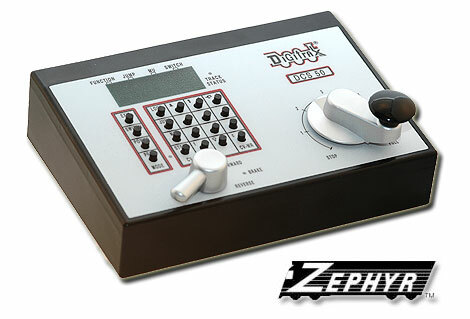 You can use one or two smooth DC power packs connected to the JUMP ports on the Zephyr Xtra to allow a friend to control a locomotive. This is the least expensive way to add another operator if you already have a DC power pack. If you don't already have one sitting around, I would not invest in one. I would go directly to option 2. 2. The Zephyr has two LocoNet ports on the back so you can connect any LocoNet throttle and have someone else control the layout along with you. 3. If you wanted the other operator to be on the other side of the railroad, you could add a Utility Panel such as the UP5 and connect it to the Zephyr via the LocoNet. Your second operator would just plug their LocoNet Throttles into the UP5 and they would have full control of their locomotive. 4. If you want to have wireless control, you could use the UR90 Infrared panel to add tetherless control; many LocoNet throttles are Infra-ready right out of the box. This makes it the most cost effective way to add wireless control to a small layout. 5. You could also add radio control, but that is much more expensive. If your layout grows larger, you may decide to go with duplex radio control at that time while continuing to use all the control components you have already purchased. That's what makes LocoNet special. Will one booster support all of this load? Possibly not, but start with the basic Zephyr Xtra and work from there. If the Zephyr repeatedly shuts off and then turns back on, you have too many locomotives on the railroad, which are drawing too much electricity from the Zephyr. You would then divide your railroad into smaller power districts; each district would have a booster and its own power supply. The LocoNet carries the command signal from the Zephyr to the various boosters and panels. How do I operate a reversing loop? The simplest approach is to use an AR1 auto reversing unit. You also can use a PM42, which would control the reversing loop and also provide circuit protection for three additional segments of your railroad. I have a friend that has DC trains and when he comes over he wants to run them. The Zephyr Xtra will operate one DC locomotive, at address "00", but, long term, you should plan to just operate DCC decoder equipped locomotives. I have 2 steamers and 6 diesels. What do I need for decoders with sound? There are many different mobile decoders available to fit almost any locomotive you may own. Decoders control the motor, functions and sound (in any) in the locomotive. Check out the Decoder Selector on the Digitrax home page to decide which decoder will be best for each of your locomotives. Some decoders will need to be installed by soldering them into the locos while others are drop ins that fit specific locos. Some have sound, some do not. It's up to you to decide what you want each loco to be able to do and to choose a decoder that can make that happen for you. Visit your favorite local Digitrax dealer or a dealer at a local show. See if there is anyone at your local club who is willing to help you learn more about Digitrax. Join the Digitrax Yahoo Discussion Group. There are several fine books available on the subject of DCC. Brows throught the Digitrax Learning Center on the Tech Support Depot. Also, take a look at the layout equipment recommendations and case studies contained in the Tech Support Depot. Model railroading has been an enjoyable hobby for many, a hobby with many facets and centers of interest. Take your time and enjoy it. You'll have a lot of fun.